When ambitious art dealer, Josephina (Zawe Ashton), stumbles upon a trove of undiscovered paintings created by her recently deceased neighbor, Dease, who has no legal heirs, she claims his work for herself. To introduce Dease to the art world, she partners with ruthless gallery owner, Rhodora Haze (Rene Russo). Capitalising on the dead man’s work becomes their mutual obsession, but as art critic Morf Vanderwalt (Jake Gyllenhaal) investigates Dease’s past, he unearths uncomfortable truths. 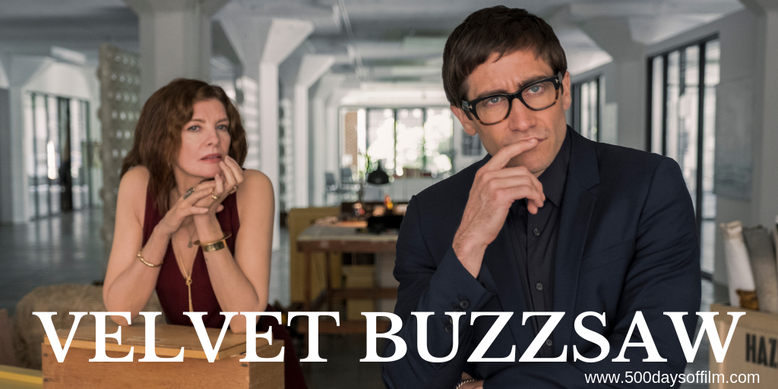 The post-Nightcrawler reunion of director Dan Gilroy, Jake Gyllenhaal and Rene Russo was more than enough to set my anticipation level for Velvet Buzzsaw on high… and then the trailer dropped. Gilroy’s film looked gorgeous, it looked fun, it looked dark and twisty and, well, it looked utterly bonkers. I was in… oh yes, I was all in. My excitement only intensified when early reviews described Velvet Buzzsaw as Ruben Östlund’s The Square meets the Final Destination franchise. It was, perhaps, foolish to allow myself to build such high expectations. Velvet Buzzsaw is a good looking film and an entertaining and interesting take on art and criticism. It features a number of brilliant performances - the aforementioned Gyllenhaal and Russo particularly. However, Gilroy’s movie is seriously lacking in thrills and, crucially, scares. The problem with Velvet Buzzsaw is that, unlike Nightcrawler, it does not build enough tension to make you truly engage with the predicament of its group of (rather deliciously unlikeable) characters. I did not care about the fate of anyone involved in the misguided sale of Dease’s paintings and found the violence too stylish and way too safe. Velvet Buzzsaw has neither the satirical smarts and raw sense of danger of The Square nor the heartstopping shocks of Final Destination. That is not to suggest that the film is entirely without merit. I thoroughly enjoyed another (in an increasingly long line) of Jake Gyllenhaal’s wide eyed, emotional unravellings and thought Renee Russo gave a standout performance (I would love to see her in far more movies). There is certainly fun to be had - I only wish this buzzsaw had more bite. Have you seen Velvet Buzzsaw? If you have, what did you think of this film? Let me know in the comments section below or over on Twitter. You can find me @500DaysOfFilm.